Knows How to Get Its Orange On! YEA BABY! IT’S PUMPKIN TIME IN PUMPKIN TOWN! Every year when autumn rolls around, picturesque Half Moon Bay bursts into a brilliant sea of orange and buzzes with excitement and activity to celebrate its bountiful and beautiful fall harvest. The dazzling journey is its own reward … the tunnel through Devils Slide is a sight to behold plus the breath-taking views of seaside farm country dotted with vast, rolling fields of orange, scarecrows, barns, and pick-your-own pumpkin patches. It's the perfect time of year and the perfect place to celebrate the beauty and bounty of the fall season and Half Moon Bay does it like nobody else. The world-famous Half Moon Bay Art & Pumpkin Festival is the season’s signature event, drawing hordes of visitors to the “World Pumpkin Capital” for an epic festival on historic Main Street. This year’s 49th annual festival will be held on October 19-20 from 9 a.m. to 5 p.m. Admission is free. Massive, mind-boggling, Volkswagen-sized weigh-off champion pumpkins on display, the mesmerizing and remarkably talented “Picasso of pumpkin carvers” sculpting and shaping monster pumpkins into one-of-a-kind masterpieces, boo-tiful harvest-inspired crafts by America’s top artists, the Sunday-only “Made on the Coast” Locals’ Artists Block featuring fine art and live music, fabulously festive food and drink, the richest/creamiest/tastiest pumpkin pie on the planet, four stages of blockbuster entertainment, everyone’s favorite home-spun parade, the world’s largest mosaic pumpkin sculpture that measures 12-feet long, 11-feet high and weighs 10,000 pounds by artist Peter Hazel, the Xfinity Take 5 Lounge with giant screen TV, ultra-thrilling bungee jumping, enchanting events and contests for the whole family, selfies and fun with the delightfully rotund, playful and mischievious Pumpkin Festival mascot “Gourdy”, the never-ending search for the Great Pumpkin, and a bumper crop of 3,000+ tons of the beloved orange orb waiting to be picked from one of the many rustic pumpkin patches around town are among the extraordinary, not-to-be forgotten attractions. No weigh. Weigh!!! Bring it on burly, beefy, behemoths! The Big Week launches with the World's Greatest Gourd Growers and their titanic orbs doing battle in the 45th Annual SAFEWAY WORLD CHAMPIONSHIP PUMPKIN WEIGH-OFF, the Super Bowl of weigh-offs, on Monday, October 14 (7 a.m., on the IDES Grounds, 735 Main Street, Half Moon Bay). Organizers are offering a hefty, world’s biggest top prize of $7 per pound and $30,000 in total prize money for a new world record entered at Half Moon Bay. 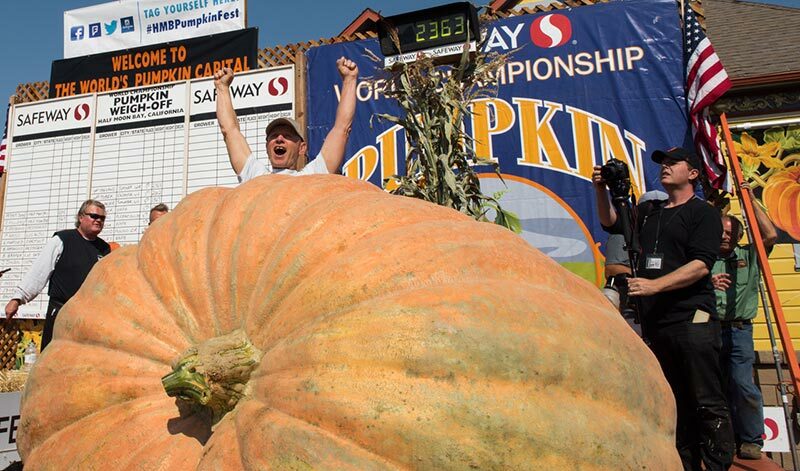 Four-time Half Moon Bay champion Steve Daletas’s gorgeous and gargantuan 2,170-pound weigh-off champion mega-gourd obliterated a formidable field of heavyweight contenders in winning the 2018 Safeway World Championship Pumpkin Weigh-Off. Daletas is expected to return along with a host of accomplished, veteran growers to contend for the $30,000 world record prize. The Goliath grand champion mega-gourd, along with the top four heaviest weigh-off pumpkins, will be displayed at the Pumpkin Festival, October 19-20. [NOTE: The following information is from the 2018 event. Follow us on Facebook to be the first to hear the announcement of our 2019 Parade Grand Marshal!] A longtime festival favorite, the Great Pumpkin Parade (Sat. 12 noon) will be lead by two-time World Series champion, three-time All-Star, Willie Mac award winner and SF Giants all-time, all-out inspiration Hunter Pence as Grand Marshal. “To Giants fans, Hunter Pence will always be remembered for his inspirational leadership, contagious enthusiasm and outstanding play as a key cog in two World Series championship teams," said Cameron Palmer, Chairman of the festival committee. "We're super excited and totally thrilled he has accepted our invitation to serve as parade Grand Marshal this year.” It’s the ultimate old-fashioned, home-spun parade featuring the mighty weigh-off champion pumpkin and grower, marching bands, classic cars, fantastic floats, and a Mardi Gras-style procession of costumed ghouls, gargoyles, goblins, ghosts and assorted surprises. Saturday, 12 noon on Main Street. The world’s largest pumpkin sculpture will be displayed at the festival. Lake Tahoe-based artist Peter Hazel, whose family has ties to the very first Pumpkin Festival, is the brilliant creator of the massive mosaic sculpture that measures 12-feet long, 11-feet high and weighs 10,000 pounds. But, unlike other giant pumpkins, this one is made of steel, cement, and ceramic tile. “It’s only fitting for Half Moon Bay to have the world’s biggest mosaic pumpkin sculpture,” said Cameron Palmer, Pumpkin Festival Chairman, who hatched the idea with Hazel and commissioned the piece. “Castroville has the Giant Artichoke … New York City has the Big Apple … Half Moon Bay should have the Great Pumpkin!” Hazel plans to attend the festival. Stop by the pumpkin sculpture to meet its creator! The coastside area is brimming with exceptional artistic talent. “Made On The Coast” (MOTC), a group of coastside artists and a sub-committee of the Pumpkin Festival, returns with their popular one-day pop-up show, Sunday, October 20th. The centerpiece of the "Made on the Coast" Locals' Block will once again be the artists' booths, showcasing top-quality arts and crafts from local painters, photographers, potters, jewelers, fabric artists, glassblowers, furniture-makers, and more—as well as live demonstrations. On both Saturday and Sunday, the Locals' Block will also feature the Half Moon Bay Brewing Company Made on the Coast Stage featuring many of the best bands on the local music scene in the parking lot of Cunha's Country Store at the corner of Main and Kelly. Buyers and browsers will find thousands of handcrafted items in well-stocked booths covering several city blocks. It’s an ideal opportunity to meet 250 of America’s top artists and craftmakers—who will be offering great variety and price points to satisfy every budget—on hand with their latest creations. Featuring original work in sculpture, paintings, photography, glass, ceramics, textiles, jewelry, leather, wood, metal and mixed media, the festival is considered among the top art shows in the country. Hand-blown glass pumpkins, beautiful vases, flatware, clocks, dishes, wall and table decorations, paperweights, stained and beveled glass, etchings, sculptures, photography, oil and watercolor paintings, beadwork, gold and silver jewelry, vests, handbags, hats, wallets, footwear, windchimes, and waterfalls will be among the thousands of items one-of-a-kind items available. "We have longtime festival favorites returning as well as many talented, new artists this year," said Kris Mason of the Pumpkin Festival Committee. "Every item you’ll see is handcrafted from beginning to end –– it’s the perfect opportunity to meet the artists that conceive and do the work." [NOTE: The following information is from the 2018 event. Follow us on Facebook to be the first to hear the announcement of our 2019 entertainment lineup!] Four stages of sensational entertainment for all ages will transform Half Moon Bay into the Bay Area’s entertainment hotspot for a weekend during the city’s monster Pumpkinpalooza. Performing on the IDES Main Stage are Journey Revisited, Robby James and the Streets of Bakersfield, The Swampers Credence Clearwater Revival Tribute, James Nash and the Nomads, The Megatones, Camino, and Jim Stevens & Friends. The Ritz-Carlton South Stage at the Gazebo will feature East Side Funk, Coast Tribe, Hank & Ella and the Fine Country Band, and Cocktail Monkeys. The Half Moon Bay Brewing Company Made on the Coast Stage includes the Patrick Maier Duo, the Keller Sisters, the Jim Moore Duo, Blue, and the Half Moon Bay High School Band. Street musicians include Emerson & The GroWiser Band, John Clarke, Bob Culbertson and Stephen Dreyfuss. The Safeway Family Stage features “Smashing Pumpkins: Battle of the Bands with the amazing, three-wheeling comic explosion known as Bob at Large, award-winning children’s performer Andy Z, sensational bluegrass band West Coast Ramblers, outstanding singer-songwriter Mark Malec, uniquely talented harpist and singer-songwriter Ella Dawn Jenkins aka EllaHarp, the School of Rock House Band, and tons of kid-friendly fun and games. Dig in! And, while you do, help fatten the coffers of community groups while savoring mouthwatering pumpkin-infused treats like pumpkin pancakes, pumpkin pie, pumpkin bread, pumpkin sticky buns, pumpkin cake rolls, pumpkin cheesecake, pumpkin cookies, pumpkin ice cream, pumpkin smoothies, pumpkin churros, pumpkin soup, pumpkin pie fudge, chicken pumpkin sausages, pumpkin seeds, and pumpkin pie soda. Then, move onto the next course with coastal favorites like Brussels sprouts steeped in a zesty marinara sauce, and artichoke hearts steamed with an aromatic blend of garlic, olive oil, and herbs. Plus traditional favorites like Portuguese linguisa, bratwurst and Italian sausage sandwiches, chicken, pork and beef tamales, hot beef sandwiches, corn dogs, roasted turkey legs and turkey sandwiches, macaroni and cheese with pumpkin seeds and spice, garlic fries, steamy clam chowder in sour dough bread bowls, hamburgers, grilled corn on the cob, garlic fries, huge baked potatoes with pumpkin currry all the trimmings, kettle corn, and caramel apples! Thirsty my friend? Cocktail fans will love the deelish artisanal cocktails – pumpkin-flavored Jack-o-tinis and traditional Bloody Mary’s from Half Moon Bay Distillery. For beer lovers, Half Moon Bay Brewing Company will offer its Pumpkin Harvest Ale, a Pale Ale made with locally-grown Sugar Pie pumpkins that are roasted with a secret blend of spices and added to the brew kettle. The result is a subtle pumpkin pie spice flavor balanced by a biscuity maltiness. Deelish! Plus enjoy a refreshing Kolsch pale ale or hop-happy Full Swing IPA, the other world-class craft brews on tap at the festival from Half Moon Bay’s award-winning brewery.Also on tap are Kona Brewing Company’s fabulously delicious Hanalei Island IPA and smooth, bright, sessionable Big Wave Blonde Ale, naturally cloudy and refreshing Widmer Hefeweizen, crisp, award-winning 10 Barrel Cucumber Crush, and low-carb, easy drinking Michelob Ultra. Sip and savor luscious varietals from Half Moon Bay Winery including this year’s limited edition Pumpkin Festival-label Sauvignon Blanc and Sangiovese Noir, Barefoot Brut Rose and Pinot Grigio plus La Nebbia Sparkling Wine and mimosas –– all available by the glass at two booths hosted by the Half Moon Bay Chamber of Commerce and Visitors Bureau. The Pumpkin Festival-label Sauvignon Blanc will also be available by the bottle (to take home) at The Beautification Committee merchandise booths. Cool off, replenish and hydrate with some crisp, refreshing ZICO Coconut Water, a bottle of PathWater, 100% responsibly and locally sourced water in an aluminum reusable bottle, or enjoy Luma Premium Soda, a delicious soda for the modern world, naturally sweetened with monk fruit and great tasting with 1/10 the calories of the big soda brands. Enjoy your favorite beverage in a beautiful, collector-item wine or beer glass adorned with the stylish festival logo. In October of the year 1918, Mr. Magnifico was bringing his “Spectacular Circus Show” to Half Moon Bay but just as they arrived in town, their train derailed, killing all the performers aboard. The locals buried the bodies behind their church but the circus performers, unaware that they had passed on, continue to put their show on every night for anyone who happens to be passing by their final resting place. We invite you to trespass past their graves and witness the Haunted Circus but beware, not all of the undead are friendly! The Haunted Circus features live (undead) actors from The Coastside Young Actors Workshop alongside audio-animatronic figures, ghosts, intense lighting, sound effects, and more unexpected surprises caused by Unseen Forces. The real treat is the Young Actors themselves, students from grade school through high school trained in the art of improvisation, staying in character, and playing for an audience. The Haunted Circus is located behind the Methodist Church, 777 Miramontes Street, just one block from the festival action on Main Street. Admission is $8 per person. Children 3 and under are free. This year, Farmer Mike, the “Picasso of Pumpkin Carvers” has been a top draw and the Pumpkin Festival’s official carving expert for over 30 years. On his Pumpkin Festival stage, Farmer Mike has created whimsical faces, movie characters like MEGAMIND, a Wells Fargo stage coach, Puff the Magic Dragon, and even enshrined Pigeon Point Light House into the shell of a pumpkin. The Atlantic Giant variety of pumpkins he carves range in size from 300-pounds to more than 1,500-pounds. Most of his incredible detail work is done using a folding Buck knife and a variety of simple chisels and he loves to interact with his audience, providing carving tips and answering questions. Be sure to stop by to see Farmer Mike carving one of his masterpieces. How often do you get to see and touch a staggeringly-massive, hard-to-believe, larger-than-life 1-ton pumpkin let alone get to have your photo taken alongside something so extraordinary? Thanks to the festival’s partnership with Silicon Valley Community Foundation, photos with the grand champion gourd will be available. Your awesome one-of-a-kind photo will be snapped and instantly printed for a special take-home keepsake. The cost is $15 per framed 5x7 picture, with discounts for multiple copies or poses. All proceeds benefit the Cabrillo Education Foundation (CEF), a non-profit for the sole benefit of the students attending our local Coastside public schools. The photo booth is at the corner of Main and Miramontes Streets. To launch your day with a good carbo-load, the High School Varsity Boys Basketball Team will fire up the griddle to host the traditional Pancake Breakfast complete with mouthwatering plain or pumpkin pancakes, butter and maple syrup, grilled sausage links, fresh juice, and plenty of coffee. Pre-sale tickets (ends October 7) are $13 for one or $25 for two and are available at http://hmbcougarboosters.org/pancake-breakfast.html. Buying presale tickets gets you to the front of the line and a shorter wait. Days of event tickets are $15 for one. Pets are not allowed at the festival and thus not allowed at the pancake breakfast area. Saturday and Sunday morning from 7 to 11 a.m. in the City Hall parking lot, Main Street near Kelly Avenue. Hundreds of ghosts, goblins, ghouls and more model their ingeniously creative Halloween attire in the Costume Contest, a popular time-honored festival tradition before walking in the big parade. The costume contest is open to all ages with individual and group divisions. Saturday, 10 a.m. in the Half Moon Bay Library parking lot, at Church and Correas Streets. Get up close and personal for this hilarious test of unbridled power-eating. Huge, gasping audiences gather to witness this stunning spectacle with each participant devouring and “wearing” a delicious 8” Safeway pumpkin pie heaped high with whipped cream. Aside from power-eating, panache and style go a long way with audience judges. “To me, the pie eating contest embodies the essence of Pumpkin Festival,” said Wilbur Collins, the spiritual and emotional leader of the contest organizing team for many years. “It encourages participation, it’s loads of fun, and it’s open to everyone. Seeing kids with face and hair full of gooey pumpkin pie, whipped cream and a big smile, it’s a truly sight to behold.” On both Saturday and Sunday, age 11 and under at 2 p.m, age 12 and over at 2:15 p.m. in the Family Fun Zone in the Bank of America parking lot, 620 Main Street. Non-competitive Pumpkin Carving will be available on Sunday in the Family Fun Zone at Bank of America, 620 Main Street. It is not a contest, there’s no judging or awards … it’s simply for fun. Pumpkins and carving knives are provided. Create your very own masterpiece anytime between 10 a.m. and 1 p.m.
Sports fans have a place to kick back and catch NFL and NCAA football and MLB playoff games on a giant LED screen in the Xfinity Take 5 Lounge. It’s the perfect spot to take a break. Couch potatoes and sports fans will find the comfort and enjoyment of their own living room without ever leaving the event. The Take 5 Lounge is a place where festivalgoers can escape the teeming crowds, relax and hang out with friends while watching their favorite sporting events on a giant LED TV, a 9' x 12' screen with picture-perfect quality. Top that off with a tasty Pumpkin Harvest Ale, refreshing Kolsch or hoppy IPA from Half Moon Bay Brewing Company and an Italian sausage or bratwurst sandwich with zesty marinara sauce fired up by the Coastside Adult Day Health Center and you’ve got a flat-out winner. Up and down the street, festivalgoers will be captivated by an array of amazing attractions. See the spectacular display of the top 4 pumpkins from the weigh-off. Catch massive air on Spider Jump’s super fun bungee jump in the Gazebo area. Test your mountaineering skills on Party Jump’s climbing wall, express yourself with creative body art at the High School Art Department’s face painting booth and create your very own magic wand and super hero mask at the Coastside Child Development Center in the Bank of America lot. Bop into Kiddieland at Filbert and Main and create your own Mexican Paper Flower Crowns design at the ALAS booth and then run, jump, bounce and slide around on the super fun Waterballerz booth run by the Boys & Girls Club! The playful, mischievious, delightfully rotund mascot will be bouncing around the Safeway World Championship Pumpkin Weigh-Off and various events and contests during the Pumpkin Festival. “Everyone loves Gourdy … he has been a huge hit and attracted tons of fans," said festival Chairman Cameron Palmer. “Gourdy will be rolling around the festival having fun and undoubtedly be the focal point of selfies and photos with festivalgoers all weekend,” said Palmer. Gourdy’s mascot costume is a one-of-a-kind custom design by prestigious design fabricator Carol Flemming. Stock up on the latest and greatest official festival gear for men, women and kids including t-shirts, sweatshirts, tank tops, baseball shirts, trucker hats, beer mugs, lapel pins, shopping bags and more. Download the free Pumpkin Festival mobile app developed by Half Moon Bay’s Phondini Partners which includes an iPad specific version and a helpful “Find Parking” feature! This fantastic app is designed to enhance the festival experience for users by providing everything from a fact sheet with key details, information on special attractions, a detailed site map keyed to specific crafts and food vendors, event and entertainment schedules, door-to-door directions, push messaging alerts, Facebook and Twitter integration, and visitor information via a full-function version of Phondini's iCoastside app. The app, scheduled to be available in early October, is available for the Apple and Android devices. This year’s festival will feature the latest and greatest exhibits featuring Organic, Natural, Healthy and Eco-Friendly products. Festivalgoers can enjoy free product samples and gather information while experiencing first-hand how these products and organizations can help you live a better, healthier and “greener” lifestyle and be a positive catalyst for change. Sponsors include Safeway “Ingredients for Life”, Dave’s Killer Bread, Legendary Foods, Bay Area Air Quality Management District, Farm Fresh To You, and Allied Waste. For home improvement ideas, check out product displays and chat with representatives from Renewal by Andersen, Heavenly Greens, Cutco Cutlery, Photos, Movies & More, System Pavers, Pella Windows, Leaf Filter, Tuff Spas, Gutter Dome, Surrounding Elements, The Craftsmen’s Guild, and Bay Home & Window. Win great prizes, enjoy free samples, meet the personalities and experience the latest products from festival sponsors: Safeway, T-Mobile, Wells Fargo, Half Moon Bay Winery, Half Moon Bay Brewing Company, Half Moon Bay Distillery, Matagrano Distributing, Kona Brewing Company, Michelob Ultra, Petaluma Poultry, AARP, Silicon Valley Community Foundation, Ritz-Carlton Half Moon Bay, Tri Counties Bank, Sewer Authority Mid-Coastside, San Mateo Credit Union, Welk Resorts, Xfinity, Comcast, KPIX 5, KBCW 44 Cable 12, Metro, Alice 97.3 FM, KCBS 740 AM/106.9 FM, KBAY 94.5 FM, MIX 106.5 FM, KRTY 95.3 FM, KNBR 680, The Bone 107.7 FM, KGO 810 AM and SamTrans. The Pumpkin Festival Committee will once again partner with Allied Waste Services, the City of Half Moon Bay and Coastal Repertory Theatre to promote and encourage maximum recycling. “Every day we talk about ways to reduce, re-use, and recycle,” said Melvin Mello Jr., Pumpkin Festival Director. “We’re on a mission to make this a Zero Waste festival –– it’s a major priority for us and something we diligently plan for and try to improve upon every year.” The Pumpkin Festival garbage and recycling operation is run by volunteers from the Coastal Repertory Theatre. In keeping with the festival’s tradition of involving community organizations, the theater troupe has been in charge of the massive garbage/recycling detail for more than 25 years, relying on the festival as one of its biggest fund-raising activities. “Since the founding of Safeway, our philosophy and vision remain the same –– provide value and give back to the community where our customers and employees live and work. Safeway is a proud sponsor of the Art & Pumpkin Festival.” The Half Moon Bay Beautification Committee salutes Safeway for its commitment to the community and its incredible generosity in supporting the festival and participating community service groups. Safeway has been the Pumpkin Festival’s presenting sponsor since 1990 and has been an instrumental partner in the festival’s fund-raising success. The Pumpkin Festival was created by the newly formed Main Street Beautification Committee in 1971 as a means for restoring historic downtown Half Moon Bay. That first year, buildings were painted, trees were planted and a legend was born. Since then, the festival has helped raise several million dollars for civic projects and community service organizations throughout the coastside. There will be parking at the south end of Main Street at Metzgar, Half Moon Bay High School (Main St. just north of Hwy. 92), Our Lady of the Pillar Church and the Community Center/Shoreline Station complex, both located on Kelly Avenue just east of Highway 1. Many parking lots are operated by local non-profit groups who charge a nominal parking fee. There is also very limited free parking on several side streets. Download the Pumpkin Festival mobile app for help in finding parking. Bicycle parking is available at the Bike Works parking lot, 520 Kelly Avenue near Highway 1, from 9 a.m. tp 5 p.m. both days. Suggested donation is $5 per bicycle. Bicycle parking is managed as a fund-raiser for The HEAL Project. Space is limited. No in and out privileges. Weather dependent. Bikes left unclaimed after the 5:30 p.m. pick up deadline will be left unattended. Learn about the HEAL Project at www.thehealproject.org. There will be specially marked handicapped parking on Purissima Street between Correas Street and Kelly Avenue. Main Street will be closed to traffic from Mill Street south to Monte Vista Lane throughout festival weekend. Southbound Main Street will not be accessible from Highway 92 from approximately 7 AM to 7 PM on Saturday and Sunday. Main Street will re-open at approximately 9 PM on Sunday. Departing the festival, Highway 92 eastbound will not be accessible from Main Street (either from the north or the south). The only way to go eastbound on Highway 92 is from Highway 1. Festival first aid and lost and found is located in the Small Hall on the IDES Grounds, the main food court and music stage area in the center of the festival. The Community United Methodist Church will be hosting the “Rest Your Weary Soles” Diaper Changing/Rest Area. The church is located at the corner of Miramontes and Johnston Streets, one block east of Main Street. The City of Half Moon Bay and San Mateo County Sheriffs Department will be enforcing the ordinance prohibiting pets on the festival grounds. For the safety, comfort, and courtesy of your pets and festival-goers, please leave your pets at home. Large crowds make it a very stressful and dangerous environment for pets. The free-admission festival will be held on October 19-20 from 9 a.m. to 5 p.m. on Main Street between Miramontes and Spruce Streets in Half Moon Bay. To get to Half Moon Bay, take 101 or 280 to Highways 92 or 84 west. You can also get to Half Moon Bay via Highway 1 from both north and south. Get directions from your location. For festival information, call the Info-Line at 650-726-9652, “like” our Facebook page, or follow us on Twitter and Instagram.